Ingredients : May Chang and Ylang Ylang Essential Oils blended in Grapeseed Oil. Allergens : Citral, Limonene, Benzyl Benzoate, Linalool, Benzyl Salicylate, Farnesol, Geraniol, Citronellol, Benzyl Alcohol, Eugenol and Isoeugenol. Ingredients : Lavender and Marjoram Essential Oils blended in Grapeseed Oil. 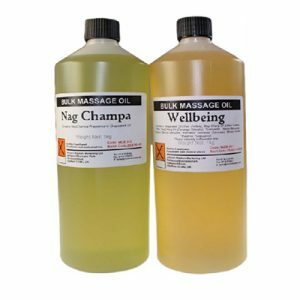 Ancient Wisdom Massage Oils are expertly blended. Not only are they designed for a great massage but each one is infused with Essential Oils add an extra special something. Sleepy Lavender Massage Oil is blended to place you into a completely relaxed state that is ideal for sleep. The blend of oils will help reduce stress related conditions and headaches before gently lulling you into a restful sleep. Allergens : Linalool, Limonene and Geraniol. Ingredients : Lemon, Juniper, Ginger and Ylang Ylang Essential Oils blended in Grapeseed Oil. Allergens : Limonene, Geraniol, Benzyl Benzoate, Benzyl Salicylate, Linalool, Farnesol, Citral, Eugenol, Isoeugenol and Benzyl Alcohol. Allergens : Limonene, Linalool, Citronellol, Geraniol and Citral. Ingredients : Lavender, Peppermint and Eucalyptus Essential Oils blended in Grapeseed Oil. Ingredients : Lavender, Peppermint and Eucalyptus Essential Oils blended in Grapeseed Oil. Allergens : Limonene, Citronellol, Geraniol, Linalool and Citral. Ingredients : Ylang Ylang, Orange & Patchouli Essential Oils blended in Grapeseed Oil.